One among the many salient features of Manchester International School is its ardent allegiance towards encouraging a life-long love of learning. Manchester International School places strong emphasis on providing a challenging and engaging curriculum, which is carefully designed to form a continuum from early childhood through high school. We seek to guide students of diverse cultural and religious backgrounds towards the achievement of their potential by offering an excellent program of studies and extracurricular activities. At manchester international School, we strive to develop students who are capable, honest, and respectful, and who are prepared both academically and spiritually to be lifelong learners and leaders of tomorrow. The school provides a broad, consistent curriculum structure using the Cambridge AS & A Level (Grade 11 & 12), Cambridge IGCSE (Grade 9 and 10), Cambridge middle year program (Grade 6 – 8) which is a preparatory stage for the IGCSE program and IB PYP (KG through to Grade 5). 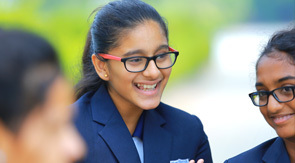 Having affiliation to IGCSE and IBO, the school is at par with some of the best international schools in the country. Manchester International School also offers CBSE stream for the students from Grade1 as national curriculum.